As much as we enjoy writing on this blog, we’re pretty bad about blogging around the holidays because we’re so busy eating and being with family. Last year, Chance had to calm everyone down when we hadn’t posted anything for days after Thanksgiving. This year is not our year to cook Thanksgiving dinner and while we’re looking forward to a delicious meal in North Carolina, we won’t have many Thanksgiving-y recipes to post for you. We try to make up for it by embracing fall and we hope you can incorporate some of what we’ve put up recently in your holiday meals. Since you’re probably reading this after the actual Thanksgiving day- what did you have this year? Anything new and unusual? Something we should try to make and post on the blog? Just hit the comment button below this post and let us know! Anyway- this year, instead of turkey and squash, we’re posting more about pears. We hope you like pears, because you’re not anywhere close to the end of hearing about them. We told you about the pear tree, and we posted a recipe for pear soup , and now it’s time for all of the good stuff we put in jars. 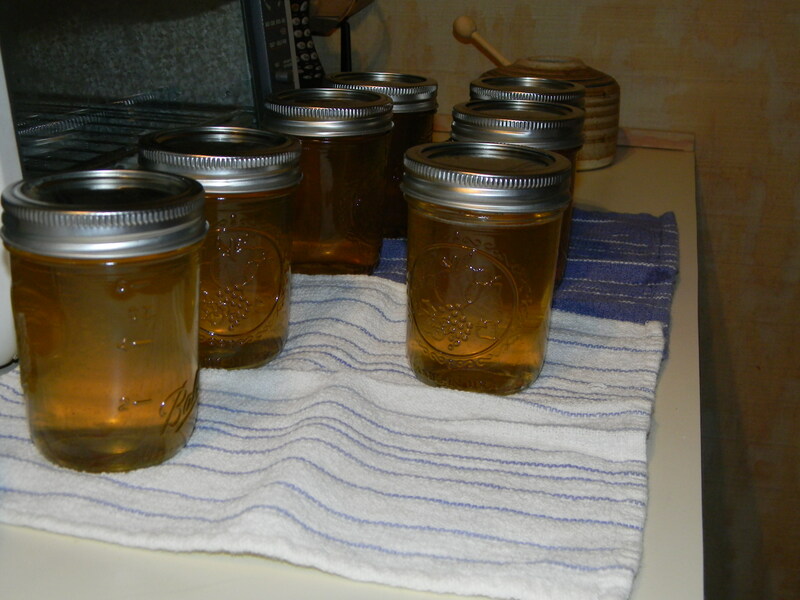 For Thanksgiving, it’s pear jelly, but stay tuned for pear chutney, pear chips, and pear syrup! Do you know my favorite pear condiment? Pear Honey! I don’t have a recipe now, but I’ll find it. You should definitely put it on your list to try.